These days, Rolex is known as the last word in slick, efficient mass production, creating somewhere in the region of a million pieces each year in one of the most advanced, vertically integrated production facilities in the world. But of course, it hasn’t always been that way. Going back a generation or three, the manufacture was still in their experimental phase, trialing different styles and various complications before settling on the core family of watches we all know and love today. That has left an archive of models built either in just the mere handful to cater to a tiny number of consumers, as special orders for certain extremely important individuals or else as very short lived prototypes. These represent some of the most fascinating and, in one or two cases, unique models in the whole of Rolex’s history. Below, we will take a look at some of our favorites. In comparison to some of the other names on this list, we are positively swimming in all the Padellones in existence out there. Originally launched in 1949, it is estimated there were somewhere in the region of 1,000 examples of the ref. 8171 made, in a mixture of steel, rose and yellow gold. Garnering its nickname from the Italian for ‘big frying pan’, for its large 38mm dimensions and slim profile, it remains one of just two triple calendar moonphase watches Rolex has ever released. The brand only very rarely attempts to dip its toes into the complicated functionality pool, preferring to concentrate instead on the simple, practical and robust. The provenance of the Padellone then, as well as its extremely limited quantities, make it one of the most collectible of all vintage Rolex. Before there was the Daytona, there was this; one of Rolex’s first, and briefest, cracks at making a chronograph, the ref. 2737. Released in the mid 1930s, it predated the Oyster case, the second of the brand’s paradigm shifting innovations (along with the Perpetual movement). Instead, it has the snap back case used by most wristwatches of the era, a carryover from the ubiquitous pocket watch. 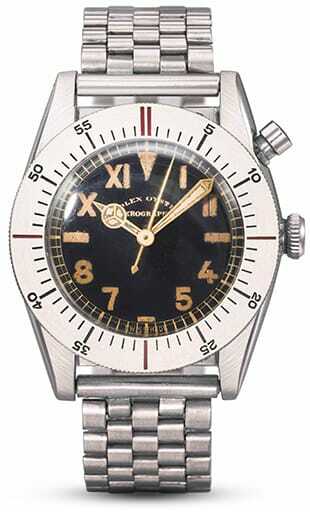 If that didn’t make it unusual enough in the world of vintage Rolex, it is also a regulator chronograph. Regulators were, as the name suggests, extremely accurate timepieces commonly used as a reference by clock and watchmakers when adjusting the time on their own creations. To make them as easy to read as possible, the hour, minute and seconds hands were separated onto their own sub dials, all powered by the same movement. xLittle more than an early experiment by the brand, there are estimated to be around 12 examples of the ref. 2737 in existence. 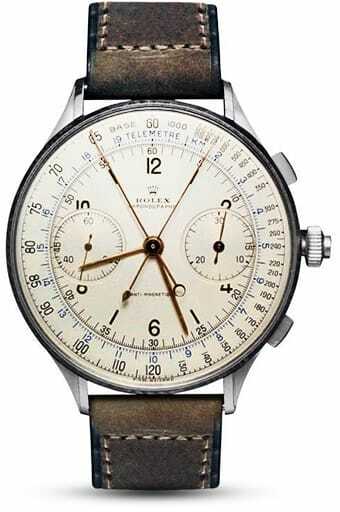 The only split-seconds chronograph Rolex ever made, and also the largest watch the brand has created to this day, measuring in at 44mm, the ref. 4113 was so exclusive it was never even offered for sale to the general public. Instead, it was given away as a gift to a very select and handpicked number of famous motor racing teams and their drivers, including the likes of Ettore Bugatti. Rolex’s relationship with the glamour of motorsport dates back to the 1930s, and this watch, of which, again, only 12 examples are thought to have been made, is from 1942. It was also the watch that held the record for most expensive Rolex ever sold not once, but twice. Most recently, one of the just eight pieces confirmed to still be in existence went under the hammer for some $2.4m. If you think about rotating bezels in relation to Rolex, the names that immediately spring to mind are always the Submariner and the GMT-Master. Before those two, however, the first serially produced model with a revolving surround was the Turn-O-Graph. Yet earlier even than that, we have the ref. 3346, better known as the Zerographe. Another abortive attempt at a stopwatch, it can lay claim to being the very first Rolex with a turnable bezel, beating the Turn-O-Graph to the concept by more than 15 years. Not only that, it also debuted the brand’s first all in-house chronograph movement, a manually-winding fly-back with stop seconds function. In its way, the Zerographe is one of the most important watches in Rolex’s history, paving the way as it does for a feature that has come to define some of their most iconic models. Astonishingly rare, it is estimated there were between seven and twelve ever made. What’s better than a President? An Emperor, obviously. That is the nickname given to the eight extraordinary looking examples of Rolex’s flagship model the Day-Date, each one created by the manufacture exclusively for the Shah of Persia in the 1970s to give away to visiting dignitaries. Bearing a striking resemblance to the Gerald Genta-inspired Oysterquartz models of the same era, with its sharp angles and integrated bracelet, the ref. 1831 actually had a Perpetual movement. Not only that, it was one created specifically for just those eight pieces; the Cal. 1566. Crafted entirely in platinum, they are thought to be the heaviest watches Rolex has ever produced, weighing in at just under 300 grams. All were awash with diamonds on the indexes and the encircling bezel, and the lacquered dials were issued in striking hues of burgundy, blue and red reminiscent of the Stella dials, alongside more reserved black and white. Almost unknown even among seasoned Rolex enthusiasts, the ref. 1831 is a remarkable chapter in the brand’s story. We said we were going to bring you the most unique Rolex watches. Well, this one is so unique, it might never even have existed! While the brand is certainly most renowned for the brilliance of their mechanical models, and the calibers that drive them, their flirtation with electronics can be traced as far back as the early 1950s. In fact, they officially patented an electromechanical design in 1952. Their research continued over the subsequent decades, and in the 1970s (when else?) they even registered plans for a digital movement, taking it all the way to the prototype stage and calling it the Oyster LED ref. 7065. Looking like a nightmarish Buck Rogers vision of a Day-Date, it is rumoredthat five were created. Four were supposedly destroyed, while the last was stolen by a light-fingered employee. Whether or not any of that is true or just another one of the anecdotes that tends to grow up around the ultra secretive brand we may never know. Let’s all just be grateful nothing ever came of it. In truth, we could have included any of a number of the world’s most famous chronograph in a list of ultra rare Rolexes. The early days of the Daytona saw the release of scores of watches with the tiniest discrepancies to the dial which are easily overlooked, but that mark them as almost unique. 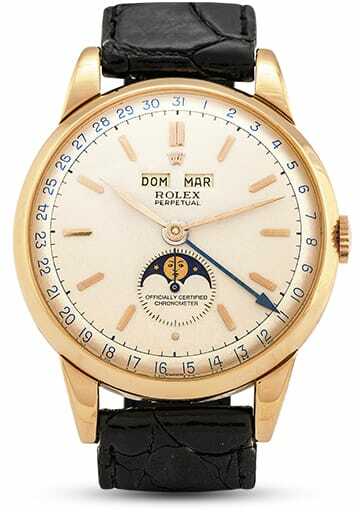 The so-called Oyster Sotto, for instance, which has the ‘Oyster’ signature below the ‘Rolex Cosmograph’ script on the face is a grail piece for many. And the ‘Gandalf’, with its grené dial the color of the old wizard’s robes, was among the first to actually wear the ‘Daytona’ title. But it is the piece which debuted in 1966 and unofficially called the ‘Neanderthal’ which stands out, for its stark pre-Paul Newman black and white coloring, oversize sub counters and lack of any text at all bar the brand name. A possibly one-of-a-kind version of the ref. 6240, it was the first Cosmograph reference with screw down pushers. The other triple calendar moonphase model from the Rolex archives, the ref. 6062 was very similar to the ref. 8171 Padellone we looked at earlier, except it was housed in a waterproof Oyster case. First appearing in 1950, it was produced in tiny numbers and in a variety of guises. Yellow and rose gold were actually the most prevalent, with only around 200-300 steel examples seeing the light of day, all dating from 1950 to 1953. In addition, there were several dial variations, including two-tone silver and a few rare black-faced pieces, with a range of hour markers. Some had stars for the indexes, known as ‘Stelline’, others were triangular in shape, called ‘Pyramids’. There were, however, only ever three gold models with diamond accents on a black dial, and only one in this configuration. It was commissioned in 1954 by the last Emperor of Vietnam, the Bao Dai, or ‘Keeper of Greatness’. A man known for his exquisite taste in all things, he made the simple request to Rolex for them to make him the rarest and most precious watch they had ever created. This is the result. It is a piece which has only changed hands twice in its 65-year history, the second time in 2017 for a then-record price of $5 million, making it, albeit briefly, the most expensive Rolex ever sold. So I said we could have entered a hatful of near unique Daytonas to our rundown, but we’ve put this particular one in because it is most definitely a one-off. Rolex only began introducing white gold into the production runs of their Cosmograph during the second phase of its life, the El Primero era that started at the end of the 80s. Before that, the manually-wound models were offered in either stainless steel or 18k yellow gold, along with a few in 14k yellow gold for a U.S. audience. That makes this ref. 6265, commissioned especially in white gold from Rolex by a German retailer in 1970, so rare it has garnered the nickname The Unicorn. It is the only known version of a four-digit Daytona to exist in the precious metal, making it the most luxurious version of an already massively revered watch. And how much is all that exclusivity worth? Well, The Unicorn sold in 2018 for $5.9m, taking it up to second place in the list of most expensive Rolexes ever sold, behind a certain Paul Newman that once belonged to a certain Paul Newman.